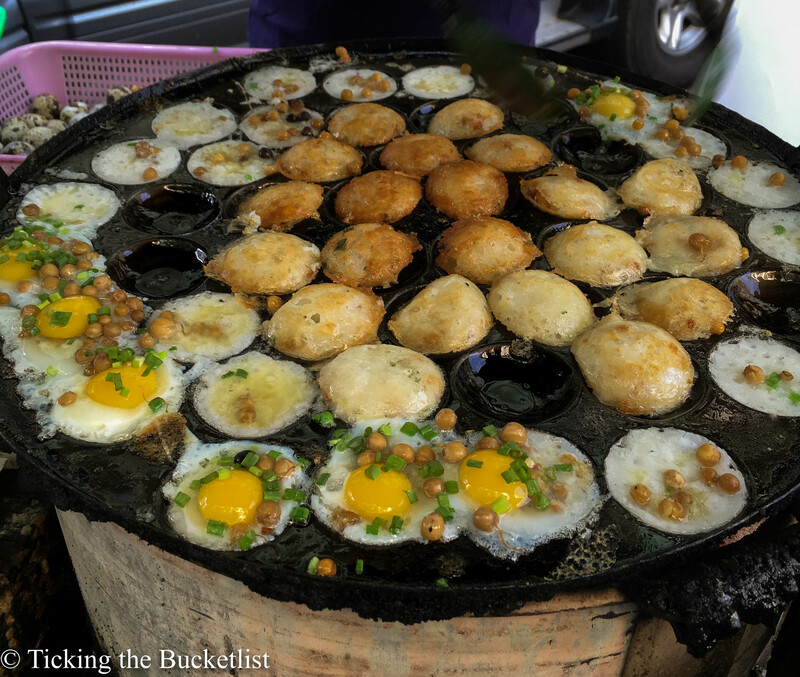 After having walked through the streets Bangkok in 2012 and having seen people snacking on crickets, scorpions and other such beings, I had dropped all hopes of ever being able to sample street food in South East Asia. Everything seemed to have some portion of an animal that either had eyes or legs at some point in time! This background made me stick to restaurants and stay away from street food while I was in Myanmar. 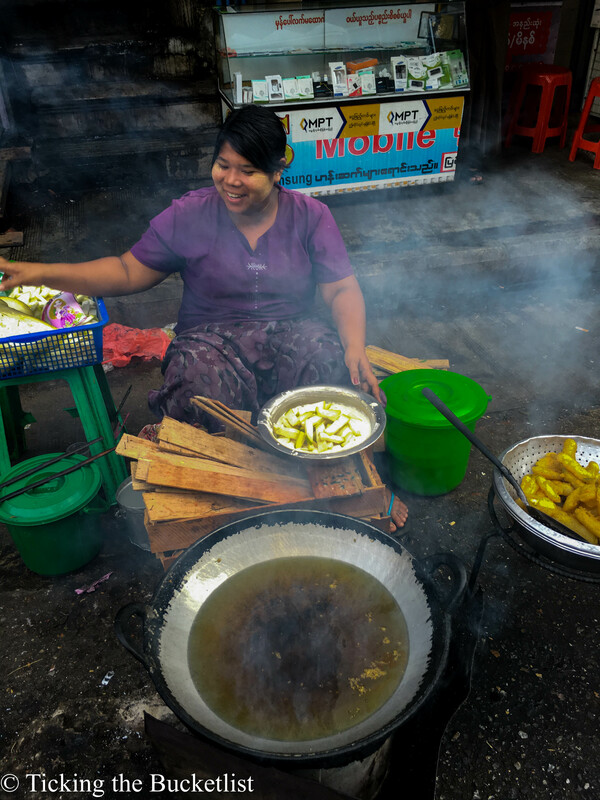 On my last day in the country, as I walked though the streets of Yangon Downtown, I glanced at the stalls that were manned by the local ‘chefs’. A lot of them seemed to have vegetarian food on the menu; there were some more with egg, but without meat. As it was my last day, and I could afford getting the stomach bug, I decided to indulge! The first time I had Shan noodles was in a Bagan… and I didn’t like them. They lacked flavour and were too gluey. However, every blog on Burmese food raves about this dish and decided to give it a second chance, this time in the Shan region itself. Voila… I had found soul food for myself… soupy, flavoursome and healthy! 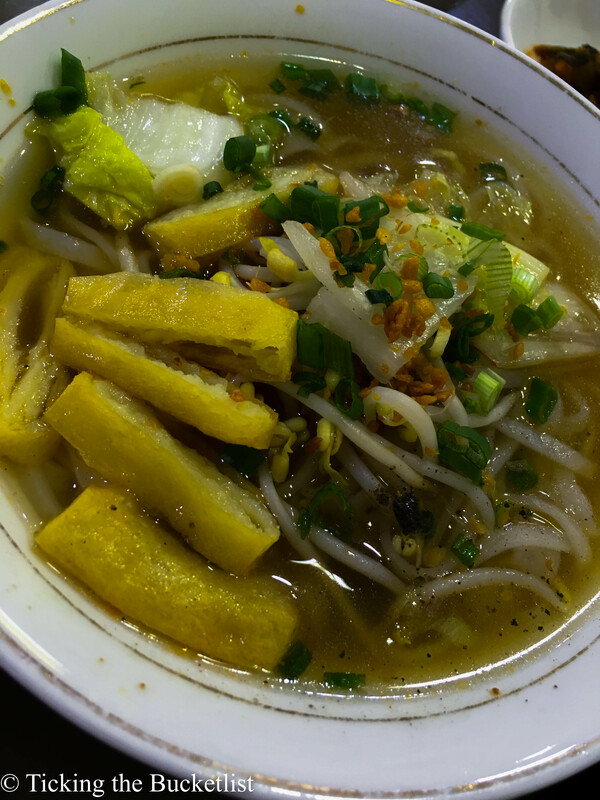 Shan noodles are popular as street food in Yangon. If street food isn’t your thing and you still want to try them, I would highly recommend 999 Shan Noodle shop, an eatery recommended by Lonely Planet as well. Don’t miss the fried tofu here as well. The name of this treat can be directly translated to ‘couple snack or husband and wife snack’. These little dome shaped pancakes are made using rice flour, spring onions and baking soda. Once cooked, each piece appears to comprise of two pancakes, with their domes facing outward, and hence the name. They are crisp around the edges and soft on the inside. There is an option of having a quail egg in it as well. I personally preferred the vegetarian version, without egg. I have read that the vendors add MSG to enhance the taste of the snack… so mind how much you want to eat! The Burmese do not seem to hold back the use of oil in their food. Yet, it is surprising that I did not come across any obese person during the one week period that I was there. 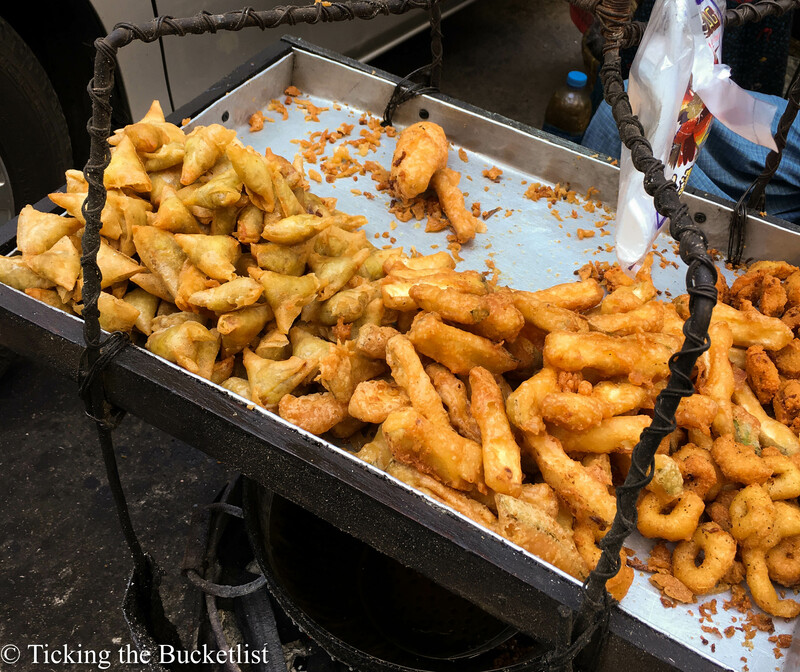 Fried snacks are common in across the country, and fried tofu leads the way. It is typically served with a sour, sweet and spicy sauce that has vinegar, red chilly and palm sugar. I loved poking the tofu with my chopstick and letting in sit in sauce for a couple of minutes in order to become more flavoursome before devouring it. The samosas in Myanmar are a little different from their Indian cousins. Our Indian readers would understand when I say that the samosas you get in Myanmar are ‘patti samosas’, which means that the pastry used is different. Also, typically, samosas in India are stuffed with potatoes. The samosas that I had in Myanmar were stuffed with mixed vegetables. Like most fried things, they were delicious but the copious amount of oil in the pastry made me consume only one. Suggest dabbing the treat with multiple tissues if excessive fat bothers you! 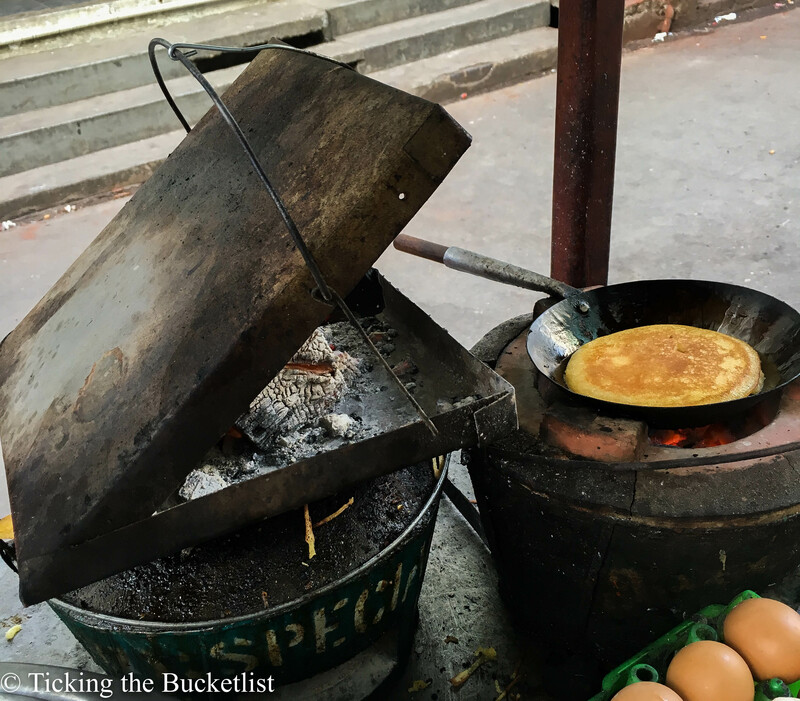 These sweet pancakes are very similar to their Western cousin, but served without any syrup. They are sweet… but only mildly, courtesy the addition of a little palm sugar and coconut. The Burmese don’t fancy cloyingly sweet food. It was most interesting to see how a make shift oven was made by the ‘chef’. He put the batter on a hot pan and placed it on a stove heated by hot coal. On top of the pan, he put a rectangular tin box with red hot coal. This ‘oven’ did a superb job at making soft pancakes which were yummy when warm. I would have loved to have them with a glass of milk! Pancakes being made in the makeshift oven! 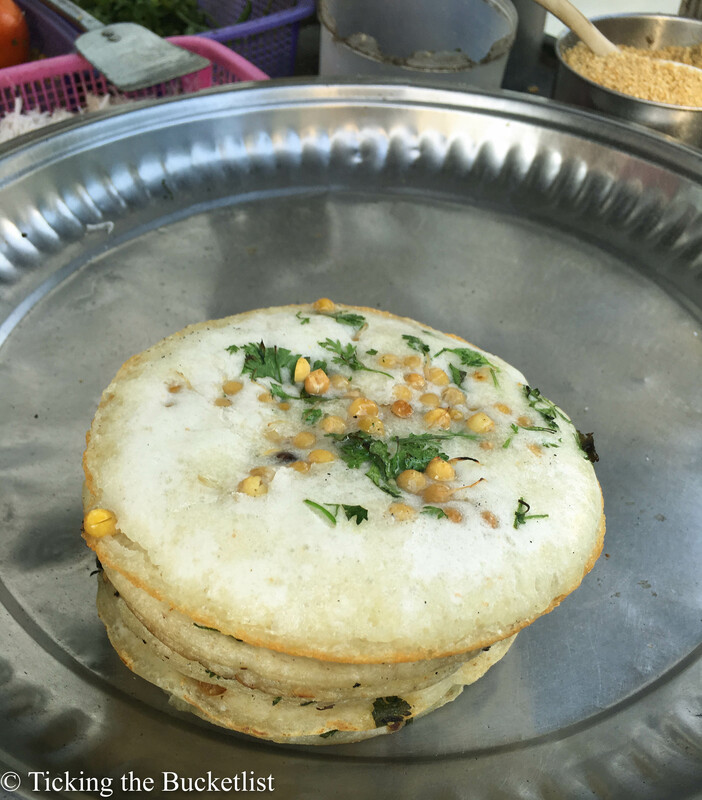 I was surprised to see savoury rice pancakes in Yangon. They looked very similar to what what we get in India – Uttampam. These thick rice pancakes, loaded with carbohydrates are pretty filling. Butter beans and onion greens add some texture to it. The uttampam isn’t one of my favourites and I decided to give this one a skip. 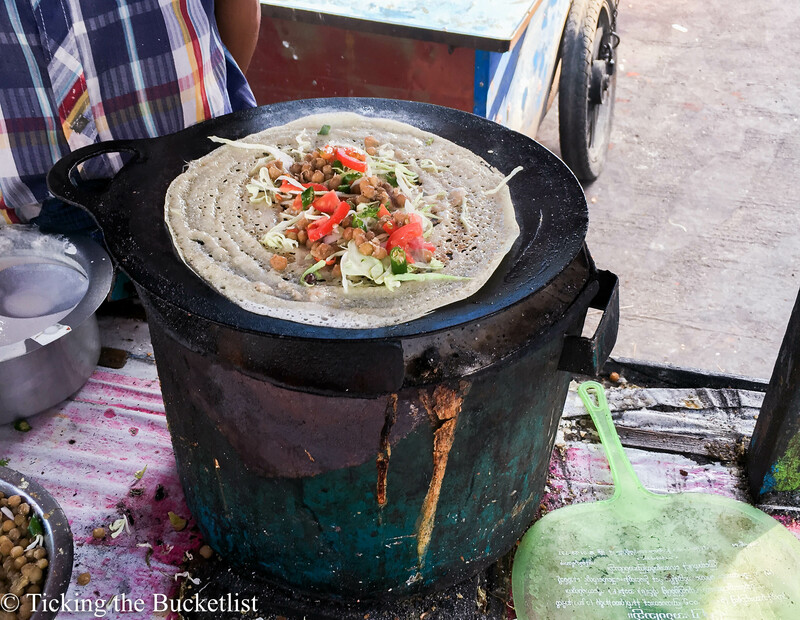 Here is something that looks like my favourite breakfast item – dosa! These rice crepes are thin and crisp. 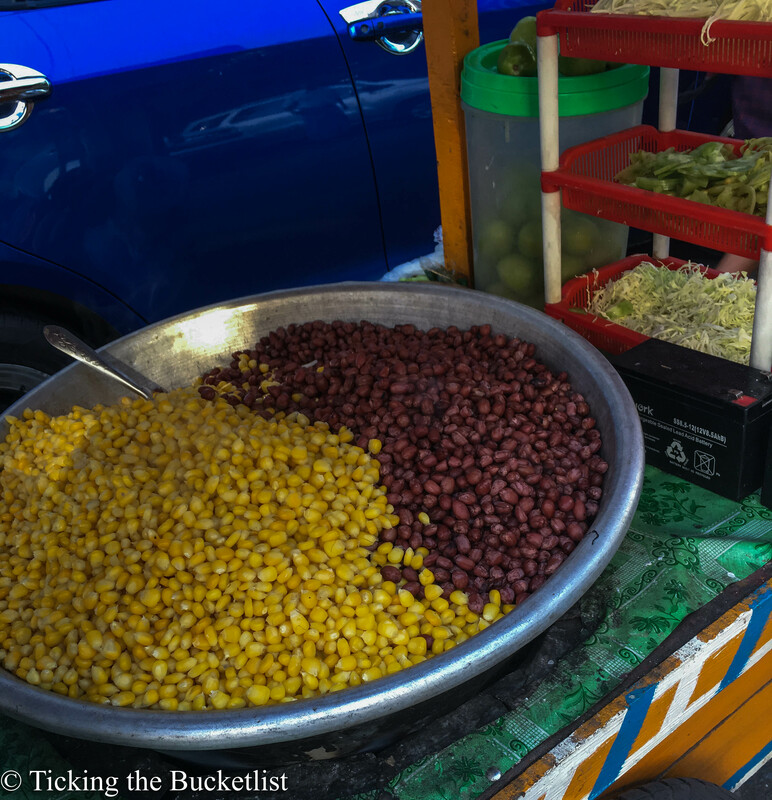 While we stuff boiled potatoes in India, the Burmese stuff raw vegetables, sprouts and beans. Regardless of the stuffing, I love the taste of the crepe and can eat it on its own without any ‘taste enhancers’. Apparently, there is a sweet version of the rice crepe available as well, with some nuts and coconut. 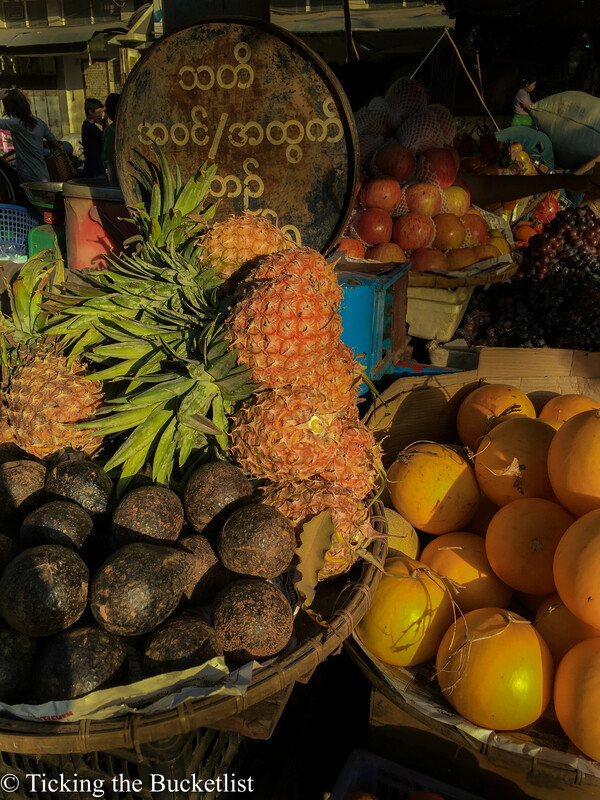 For those who are seeking a healthy option, as all Burmese food is high in oil and fat, it would be wise to pick up some fresh fruits. I enjoyed the sweet papaya and watermelon slices every morning with my breakfast. The little oranges were an ideal afternoon snack. The avocados were so good that I bought a couple and carried them all the way to India! Here comes another option for healthy eaters…a salad made with boiled corn and peanuts. Throw in some cabbage, onions, sprouts, peppers and cilantro. Top it with some pickled tea leaves, garlic and chillies…it is as Burmese a dish as one can be! The spices suit the local palette and I am sure, go well with most Indian palettes as well. I am not sure what spice tolerance others have, so ask the vendor to mind the chillies! Here is another thing that I love having at home as an evening snack – steamed/boiled tubers. It is the dressing that makes it taste different in Yangon… crushed peanuts, sesame seeds, salt, chilly and some oil. 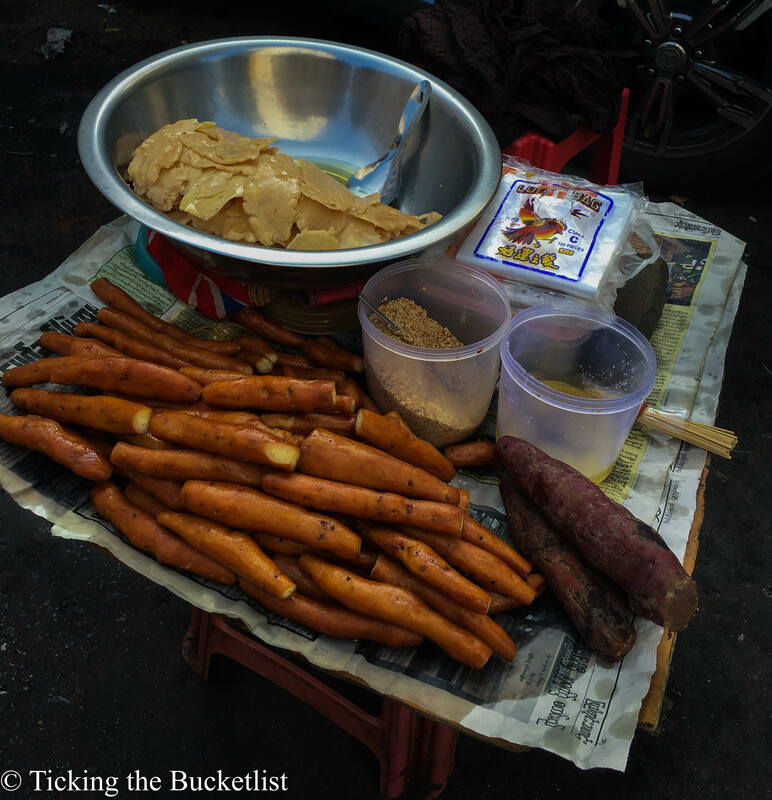 Voila… there it is… your very own tuber, the Burmese way! 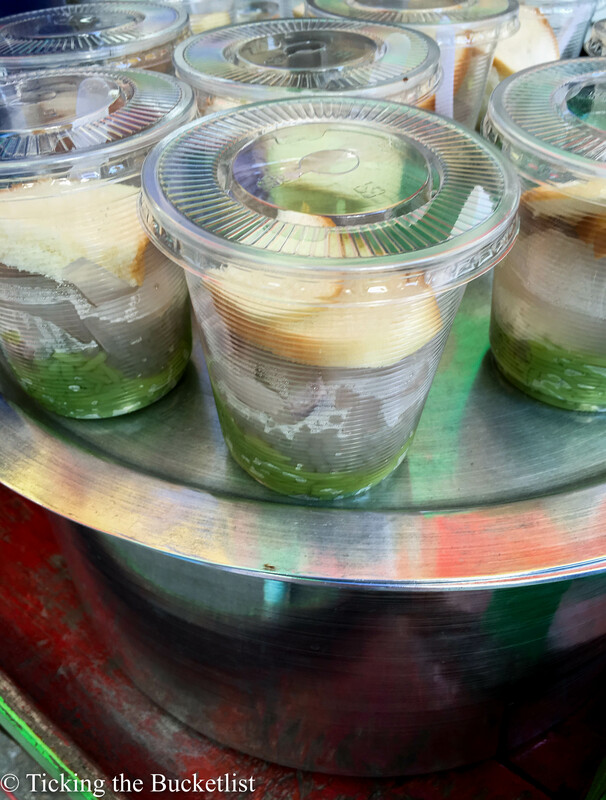 A popular Burmese dessert, this colourful dish has some sea weed agar jelly and sago, topped with sweetened coconut milk/cream. It is usually served with a slice of bread to mop up the coconut milk. This dish reminded me of its Thai cousin (Tub Tim Grob) which has red water chestnut rubies and tapioca in sweetened coconut milk. It is such a delight to have these desserts if one is lactose intolerant! While this is available in Yangon, I first tasted this dessert in Mandalay at a sweet shop. 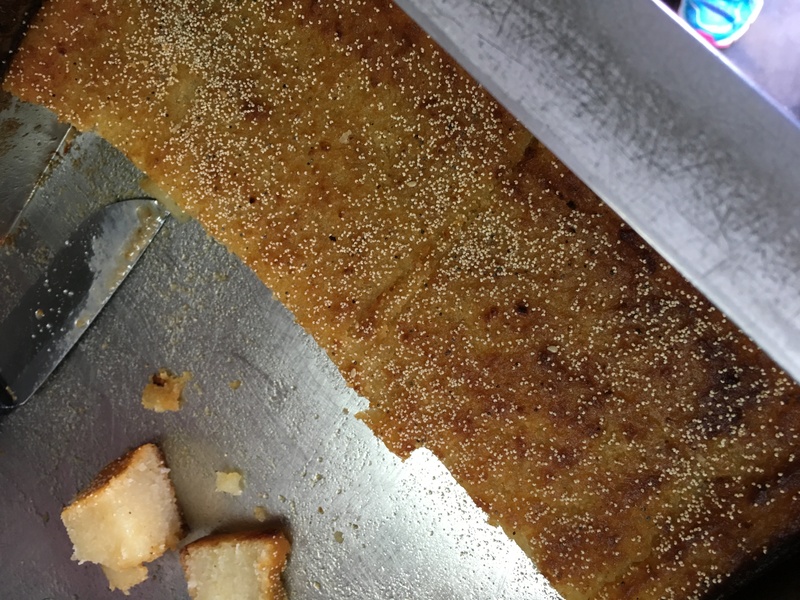 The Shwe Kyi is a dense semolina cake, baked with loads of coconut and garnished with some poppy seeds. I loved the rich, creamy texture of the cake and the flavour of the poppy seeds elevated its taste by a notch. I need to find a local who can share its recipe with me…my kitchen is waiting! So, are you all set to hit the streets of Yangon? Semolina cakes , savoury pancakes , crepes , fried tofu , and the awesome Shan Noodles. My list of favourites. There is so much to choose from , vegetarians do feel pampered in this part of the world. Totally agree to that Shweta! I just wish I had eaten more of the semolina cake!